It is critical that your Advantage chiller be provided with a constant water or water/glycol flow rate. Standard chillers require 2.4 gallons per minute (gpm) per ton of rated cooling. For example, a 10-ton chiller requires a constant flow of 24 gpm. If the flow rate is less than 24 gpm performance is affected and the unit may trip on its low pressure limit switch. Customized units may be designed for lower or higher flow rates. If your process will experience lower than design flow rates or intermittent flow, a low flow bypass valve will be required. For example, intermittent flow rates may occur when temperature control solenoid valves open and close or when more than one process is being served by the chiller and the processes don't always operated continuously. The factory installed optional low flow bypass may be a manual ball valveOpenor a pressure actuated automatic valveOpenand it is installed between the "To Process" and "From Process" lines on the chiller. It may be installed inside or outside the sheet metal enclosure depending on the specific chiller model. Start with the bypass completely closed and gradually open the valve. Do so until the low refrigerant pressure gauges reading is in the normal operating range for the refrigerant type used in the chiller. For Automatic Low Flow BypassT" handle or adjusting stem is located on the top of the valve. Turning the "T" handle or adjusting stem in the clockwise direction puts more pressure on the valve's spring reducing bypass flow. Turning the "T" handle or adjusting stem counter clockwise puts less pressure on the spring and increases bypass flow. Adjust the "T" handle or adjusting stem until the low pressure gauge reading is in the mornal operating range for the refrigerant used in the chiller. If the low pressure guage reading is below normal, reduce the pressure on the spring to provide more bypass. Most chillers include an integral open to atmosphere water reservoir and pumping system. On portable chillers and small central chillers these reservoir have adequate volume to support the flow rate of the process but may not have adequate reserve volume to hold the water that remains in overhead system piping. When overhead piping is installed in the system and the system is in the "off" position the water in any overhead piping may drain to the lower point in the system which is the open reservoir in your chiller. If the chiller reservoir does not have adequate volume, the reservoir will overflow. To avoid reservoir overflow, Advantage recommends the installation of an optional overhead piping kit. 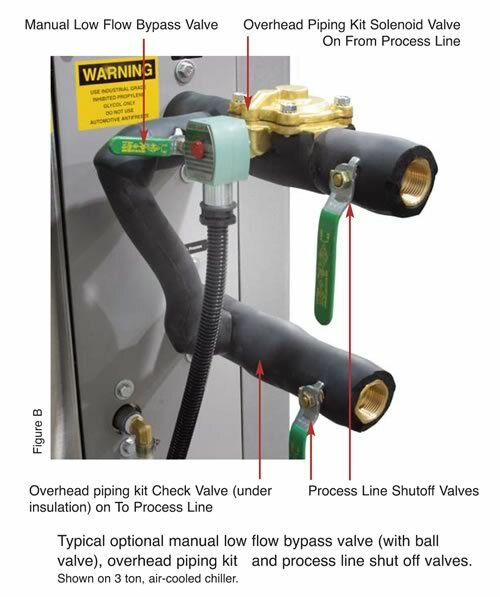 The overhead piping kit consists of a full line size solenoid valve in the "From Process" line that is interlocked with the pump and a check valve (single direction valve) in the "To Process" line. When the chiller pump is on, the solenoid valve opens and the check valve allows flow to the process. When the chiller pump is off, the solenoid valve closes and the check valve prevents water from flowing back to the open reservoir trapping water in the overhead piping. The overhead piping kit is normally factory installed but can be field installed when necessary. 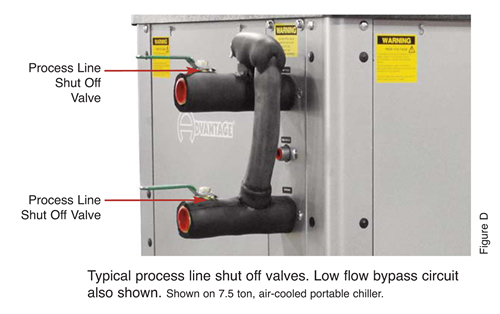 Advantage chillers can be equipped with factory installed process line shut off valves. These valves are full size ball valves installed on the "To" and "From" process lines at the exit of the chiller. 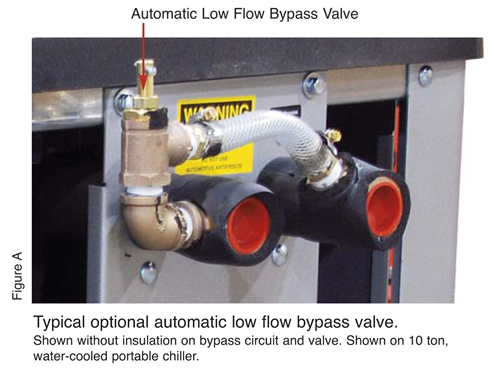 These valves can be used to adjust the process flow rate and to shut off the flow rate to isolate the chiller. Would you like to Download FYI #299 to your browser?